I made my eleventh trip to Poland at the beginning of May, 2014, with the intention of photographing many historic Jewish sites, mostly cemeteries and synagogues, not visited on earlier trips. In seventeen days, my wife, Naomi, and I travelled a long arc though central Poland, starting with Bialystok in the north, all the way down to Katowice and then looping back up through Lublin before heading for Chopin airport and home. The journey took us through diverse historical landscapes, from areas close to the Lithuanian and Belarusian borders, through the central Polish heartland, and to Silesia which was part of the Kingdom of Prussia before the First World War and whose historic cemeteries are distinctively German in character. These travels through Poland have been inspired in part by Polish photographer and researcher Monica Krajewska’s groundbreaking photo essays in two books, A Time of Stones (1982) and A Tribe of Stones (1993). When she made her survey of Jewish burial places, they were mostly in an extreme state of neglect, overgrown, crumbling, seldom visited, and encroached upon by an uncaring Polish population. Today, the situation can hardly be more different. Jewish cemeteries and synagogues have been recognized as a valuable cultural asset of Poland and many of them have been rehabilitated and are visited by the country`s significant number of Jewish tourists as well as the many Poles curious about Jewish heritage. Nevertheless, most Jewish cemeteries outside the major cities continue to be in peril. Cared for in many cases by single Polish caretakers, or often by students, the survival of beautifully carved memorial stones is threatened everywhere by natural forces, the weather and rapidly growing vegetation, and the lack of financial and human resources to properly care for these “gardens of history.” For instance, in the town of Krynki, northeast of Bialystok near the Belarus border, the cemetery lies next to a farmer’s field, and consists of a few stones left standing, many fallen stones surrounded by grassy mounds and large stretches of the cemetery inaccessible because of high vegetation. The same problem of accessibility exists in the cemetery in Ozarow, south of Radom in the centre of the country. The Ozarow cemetery features some of the most beautifully carved stones, with polychrome colouring, to be seen anywhere in Poland, yet most of the cemetery is impassable because of dense brush. 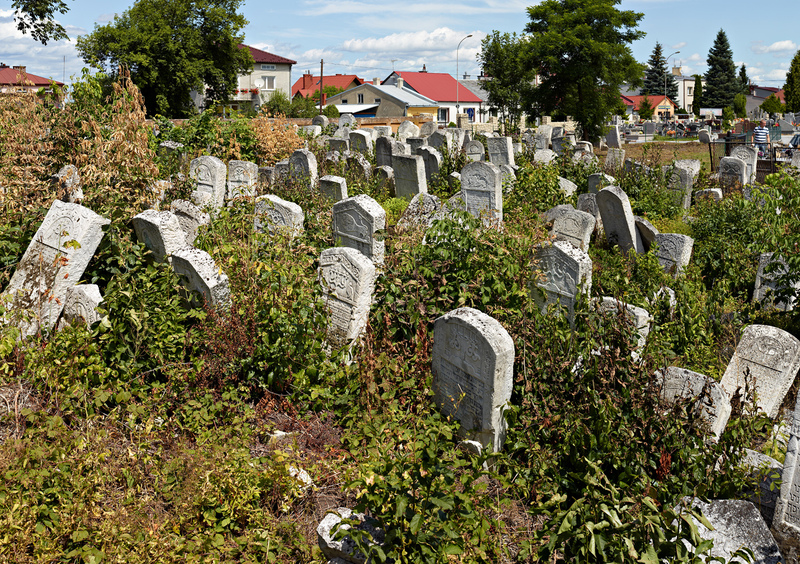 Even in the relatively well-cared for cemetery in Lodz, the largest Jewish burial site by area in Poland and possibly Europe, whole precincts of the cemetery are now completely overgrown with small trees and interspersed dense vegetation, which make their grave markers unreachable and unreadable. Though my photographs, compared to Krajewska’s, show a great deal of improvement in major centres, they also show that the danger to a large portion of Jewish material culture in Poland remains, despite greater awareness and good intentions on the part of many people. Nature is unstoppable, the Polish earth is fertile, and memorial gardens must be tended throughout the growing season to prevent vines and trees, grass and moss, beautiful though they are in their place, from the incremental obliteration and eventual destruction of monuments. Though the creation of the new museum of Polish Jewish history in Warsaw is a remarkable achievement on many levels, the Jewish material culture of Poland lies outside of the museum’s walls, in the cities and towns where Jews once lived. It is in those places that efforts should be concentrated and money spent, not only in synagogues, many of which have been refurbished, but in the numerous cemeteries which require major work to stabilize the environment and preserve the monuments. There is a desperate need for a national strategy for the preservation of Polish Jewish cemeteries and, in particular, a need to document and preserve the most outstanding examples of memorial art before they disintegrate further in the face of natural forces. The great Russian Jewish researcher, David Goberman, spent many decades, from the age of Stalin in the 1930s up until the 1960s and the modern Soviet era, documenting and photographing Jewish memorial art throughout former Soviet lands including Belarus, Moldova, and western Ukraine. Fortunately we have his photos, a selection of which were reproduced in an American book, Carved Memories, sixteen years ago. In his preface, Goberman writes that the major proportion of the monuments he photographed have since disappeared, owing to war, looting and indifference. It would be tragic if the magnificently carved memorial stones to be found scattered throughout Poland today are not preserved and meet the same ultimate fate.